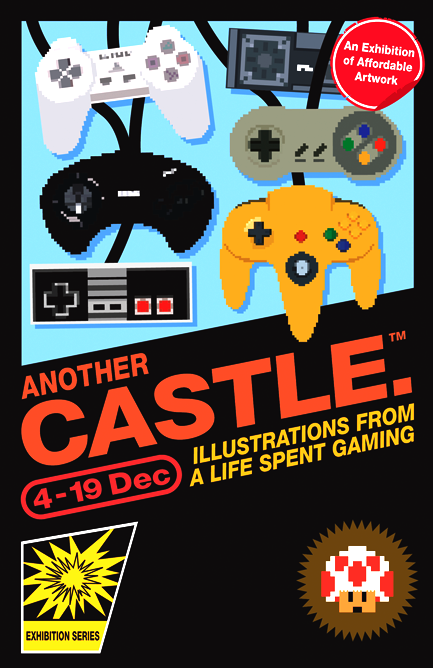 Join us for a celebration of the last 25 years of gaming as some of London and Brighton's top up-and-coming illustrators and graphic designers pay tribute to their favourite video games of all time. Featuring a diverse range of affordable screen prints and one-of-a-kind pieces that video game fans will love.Take part in a multi-player face-off against your favourite artist or prove your retro gaming skills in our Nintendo tournament. Games based events will take place every Saturday that the exhibition is running. We'll post more information about these events as they are confirmed. For more information please contact info@another-castle.co.uk or post your queries on our Facebook events wall. Situated half-way down the road, between the Basketmaker Arms and The Fountain Head pubs, the A&E gallery is situated in Brighton's North Laine, a 10 minute walk from the station.